Dr. Zafar: When exactly did the discussion on Mahdi originate? Did it gain currency during the Prophet’s time, or after his demise? Some are of the view that this belief did not exist at all in the beginning of Islam. It became popular only towards the latter half of the first century, when some Muslims ascribed Muhammad b. Hanafiyyah as the ‘Mahdi’ and called the others towards him. Even when Muhammad b. Hanafiyyah expired, they claimed that he was alive, residing in a mountainous cave and would return some day to revive the religion. Professor Nasir Mahdi: The discussion on Mahadaviyat was always popular among the Muslims right from the dawn of Islam. The Prophet (s.a.w.s.) had time and again stressed on the Mahdi’s existence. He had taken great pains to clearly explain various aspects of his personality, like his name, his agnomen, his reign, etc. There are plenty of traditions in this regard from the Prophet (s.a.w.s. ), which have come to us from various sources, Shia as well as Sunni. Both these sects have considered such traditions as authentic and reliable. We mention here only a few to highlight our claims. ‘I give you glad tidings of (the advent of) Mahdi. He will re-appear when there will be intense discord and strife among the people. He shall fill the earth with peace and equity, like it would be torn apart with tyranny and oppression. His followers shall be obedient and will be inclined towards Allah’s worship. His reign will be marked with tranquility and serenity. Maulvi Abdul Gani: Professor Nasir, other scholars are aware of this fact, and I think you should also be made aware of it as well, that I represent the Ahle Sunnah. Also, I do not agree with the Shia traditions relating to Mahdi. I believe that some prejudiced Shias wished to inculcate this belief among the masses. And with this objective in mind, they coined certain traditions that gave credence to this belief and associated such traditions with the Prophet (s.a.w.s.). One fact that supports my contention is that traditions on Mahdi are to be found in Shia records only. There is absolutely no mention of such traditions in the six authentic Sunni books (Sihaahe Sittah). 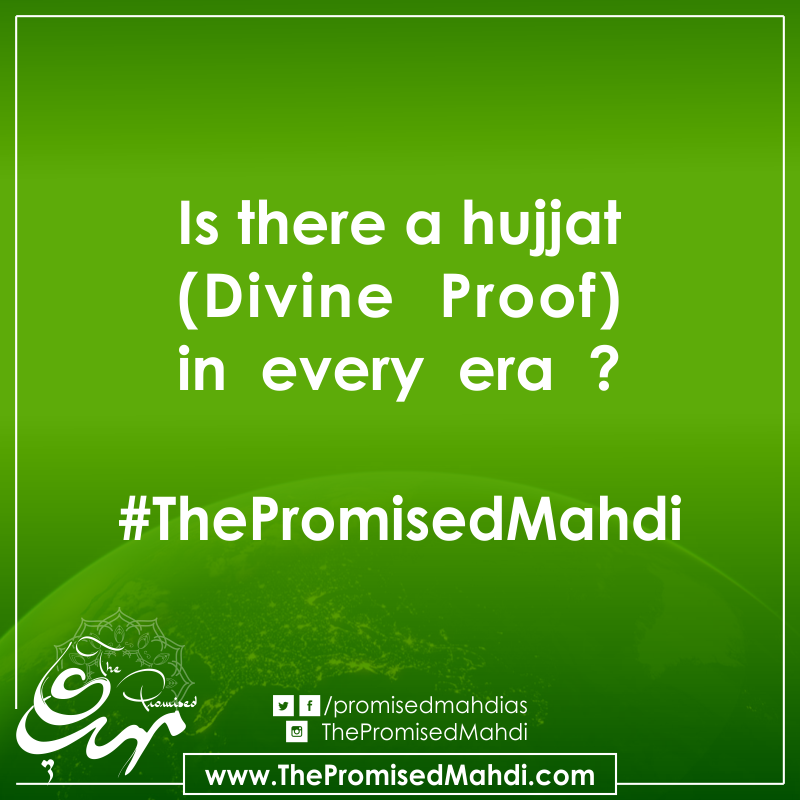 However some of our not-so-reliable books have discussed this belief in Mahdi. Professor Nasir Mahdi: The Bani Ummayah and the Bani Abbas due to their intense hostility and hatred towards the Ahle Bayt (a.s.), completely banned the narration of traditions that espoused Imamate, Vilayat (guardianship) and the importance of Ale Muhammad (a.s.). Despite such strict prohibition, traditions on Mahdivayat have found their way in your books too. If you are not getting wearied, I may relate some traditions from such books. Dr. Zafar: Professor Nasir, please go ahead. Tirmizi has narrated the above-mentioned tradition, in his Sahih, and believes that it is reliable. He has also recorded more traditions on Mahdi, narrated by Ali (a.s.), Abu Saeed Khudri, Janab-e-Umme Salmah and Abu Hurayrah. ‘Even if one day is left before the destruction of the earth, Allah will raise a person from my progeny, who will establish peace and equity on the earth as it would be ridden with injustice and oppression. ‘Our Mahdi will have a broad forehead and a thin and protracted nose. He will fill the earth with amity and equity as it would be inundated with oppression and injustice. His reign will last for seven years. Maulvi Abdul Gani: The author of ‘Al Mahdi fil Islam’ (The Mahdi in Islam) has written, ‘Muhammad b. Ismail Bukhari and Muhammad b. Hajjaj Nishapuri (the compilers of the Sahih-e-Bukhari and Sahih-e-Muslim) have not mentioned any tradition relating to Mahdi, in their respective Sahihain. The books compiled by these two scholars are considered among the most acclaimed of Sihah, wherein they have narrated some of the most bona fide and veritable of traditions. Of course, some traditions from the Sunan of Abi Dawood, Nisaai and Ibne Majah and Sahih Tirmizi have been related, but later scholars and traditionalists, such as Ibne Khaldun, have branded these traditions as unreliable and rejected them completely. Professor Nasir Mahdi: It is better that we commence our discussion on this topic by narrating what Ibne Khaldun has written in his ‘al-Muqaddamah’. He writes, ‘Mahdaviyat was always a subject of heated discussion right from the earliest Muslims. And even now Muslims maintain that a person from the Prophet’s progeny shall rise in the last era, and will revive the religion, establish peace and justice and command indisputable dominion over all Muslim nations. Such traditions are mostly narrated by a group of scholars viz., Abu Dawood, Ibne Majah, Tirmizi, Tabarani, Haakim (Nishapuri) and Abu Ya’li Musali. However, those skeptical of Mahdi have impugned the validity of such traditions. Hence it is necessary that while discussing traditions on Mahdaviyat, mention should also be made of such objections and censure so as to clearly discern the truth. However, it must be noted that, if such traditions have been disapproved by the scholars of narrators (ulamaa-e-rejaal) on account of the unreliability of the chain of narrators, then the traditions are invalidated outright. This is regardless of the fact that these very narrators have been considered reliable in some other place. For, scholars of narrators are unanimous in their opinion that, if the reliability of a narrator has been considered dubious in one place and veritable in another, then the former will take precedence over the latter. In other words, he will be considered as unreliable. But an exception has been made in the case of Sahihe Bukhari and Sahihe Muslim, wherein some narrators have been considered reliable in some places and unreliable in certain other places, but traditions on both occasions are deemed veritable. This anomaly is due to the consensus among the scholars of Ahle Sunnah who hold these two books in the highest esteem, and enjoin compliance with the traditions, regardless of the reliability of the chain of narrators. However, these two books are an exception to the rule and other books have not been accorded the same status. This was the summary of Ibne Khaldun’s opinion. After this, he has discussed the narrators of traditions and the yardsticks to gauge their reliability.